Notorious dictators may not be the people we typically associate with methamphetamine, but a report claims that, during World War II, Adolf Hitler regularly took methamphetamines for a variety of ailments, including the drug Pervitin, a precursor to crystal meth. Last year, letters written by Heinrich Böll—who was conscripted into the Wehrmacht during World War II and later went on to win the Nobel Prize in literature—confirmed that some Nazi soldiers took Pervitin, which was billed as an "alertness aid." The drug was sold by Berlin-based drug maker Temmler Werke starting in 1938, and British newspapers at the time reported that many soldiers were taking this "miracle drug." The Independent is reporting that a wartime dossier compiled by American military intelligence reveals that Hitler also took this miracle drug. Supposedly, the dossier lists 74 different medications that Hitler took, including injections of Vitamultin, which contains methamphetamine, and the aforementioned Pervitin. The dossier further claims that Hitler took methamphetamine before his final meeting with Benito Mussolini in July, 1943. 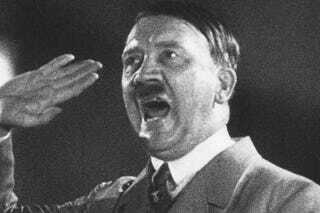 It paints Hitler as a person who became increasingly dependent on drugs, notably meth. There is one wrinkle in this report, though. The Independent doesn't quote from the dossier itself, but instead quotes Bill Panagopoulos, "an American collector who discovered the dossier." And the report comes out as a documentary about the dossier, Hitler's Hidden Drug Habit, is about to air on Channel 4 in the UK. We'll have to see if other sources verify the authenticity of this dossier (and stand behind the reliability of the intelligence), although it certainly seems plausible that, like his soldiers, Hitler took Pervitin. And we do know that Hitler did sometimes receive methamphetamine treatments from his physician Theodor Morell; tests of packets containing Vitamultin, a substance Morell prescribed to Hitler, have been found to have contained methamphetamine. So we do know there was at least some methamphetamine in Hitler's medical regimen. The question is whether the additional information this dossier provides, and the vision of a drug-addicted Hitler it suggests, is accurate. Edit: I feel it's worth adding, as LexW rightly points out in the comments, that stimulant use by soldiers and world leaders on all sides was not uncommon at the time.